Prince Edward has always been a treasure trove of cheap and eclectic eats, which is why Sam Fun Chuk Hei fits in right off the bat. 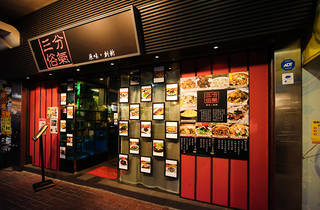 The menu here is a diverse compilation of Asian flavours, with dishes ranging from Sichuan-style appetisers to Taiwanese meat stew and fish fillet in Hokkaido milk sauce. Not knowing where to begin with the haphazard near-100 item menu, we happily went with the waiters’ recommendations. First up was a medley of cucumbers, asparagus and shimeji mushrooms doused in a light wasabi dressing ($68). The pungent sauce added a mustardy kick to the crunchy greens, making it a satisfying start to the meal. Poultry dishes are also done particularly well here thanks to the quality of the ingredients (the restaurant uses fresh, locally reared chicken). Wings turned inside out for easy pecking come piled under a scrumptious heap of fried, spicy preserved vegetables ($58). Hakka-style “three cup chicken” ($98 for half) arrives still sizzling away in a claypot. A glass of huadiao wine is poured in before serving, infusing the meat with a sweet floral aroma. But the best part is the strips of chewy rice cakes which are tossed in to soak up all the delectable flavours on the bottom of the pot. Unfortunately, the meal was all downhill from there. Blanched squid tentacles ($58) were close to depressing. Served chilled over ice, these tasted bland and boring even after being violently drowned in vinegar sauce. Baked pork ribs marinated in vinegar and hawthorn ($62) carried a delightfully tart taste but were frustratingly tough on the bone and difficult to devour. 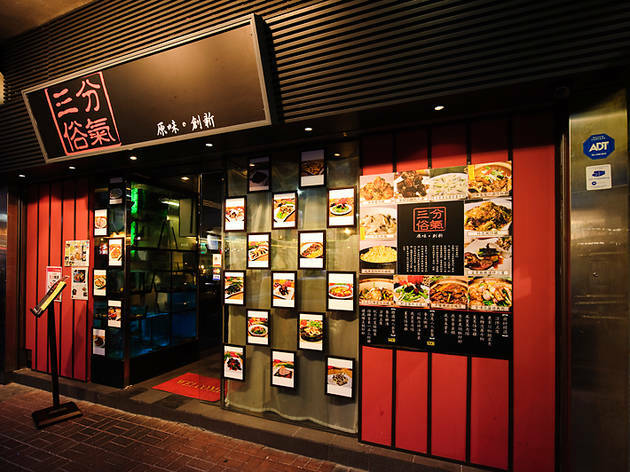 211 Fa Yuen St, Prince Edward, 2392 4008. Mon-Fri 6pm-1am & Sat-Sun noon-1am. Meal for two: around $300.